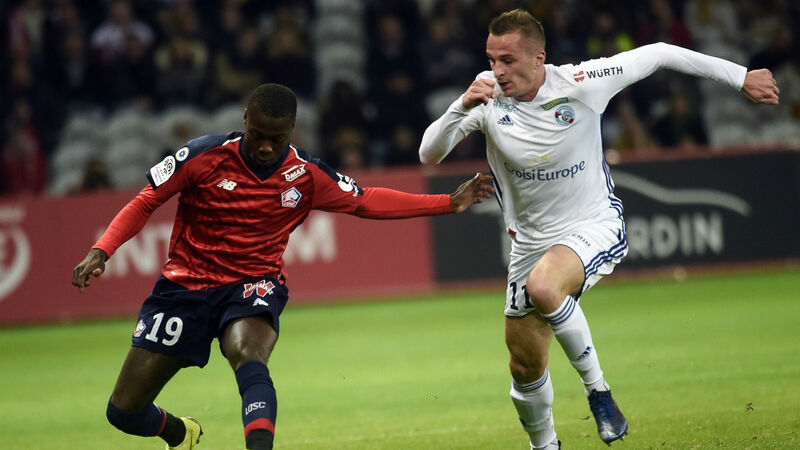 Lille were held to a 0-0 stalemate by Strasbourg in a French Ligue 1 encounter, with star man Nicolas Pepe silenced by the visitors on Friday evening. After last week’s away loss to Paris Saint-Germain where the Cote d’Ivoire international netted a late consolation, the hosts were looking to return to Stade Pierre-Mauroy with a positive result but were frustrated by Thierry Laurey’s side. Despite dominating the encounter with 18 shots [eight on target] mustered towards their visitors’ goal they had to settle for a share of the spoils, with their star man – on from start to finish – unable to get his ninth Ligue 1 goal of the season. South Africa marksman Lebo Mothiba was on show for the resolute away side, and was cautioned for his troubles before making way in the closing stages. Meanwhile, Pepe, who has been capped nine times by Cote d’Ivoire, earlier revealed that he is enjoying the attentions he is receiving from big European clubs including Bundesliga duo Bayern and Borussia Dortmund, Arsenal, Atletico Madrid as well as Chelsea.